One would think that with all the technology we have available and modern science there is no question about the safety of having a baby in the United States of America. Upon a close examination, there are some alarming trends that say otherwise. In this article, I address some of the factors causing the rising maternal death rate, the disparities in outcomes between black and white women, and the differences between the medical and midwifery models of care for birth. According to the CDC 2015 National Vital Statistics Reports, approximately 98 percent of women give birth in the hospital with the majority of the remaining 2 percent giving birth at home (Martin, Hamilton, Osterman, Driscoll, and Matthews, 2017). One in three women nationwide are giving birth by cesarean section, which has its own set of risks for the mother, including infection, injuries to the bowel or bladder, blood loss, blood clots, and reactions to anesthesia or medications used for the surgery (Gregory, Jackson, Korst and Fridman, 2011). As with any major surgery, there is always a risk of death from complications. In the United States, 26.4 out of 100,000 women die in childbirth every year (Kassebaum et al, 2016, as cited in The Lancet 388(10053). As can be seen in the chart below, we are the only country out of 13 other industrialized nations with a rising maternal death rate (i.e. death from pregnancy-related complications) (Kassebaum, et al, 2016). For every woman who dies in childbirth, there are 70 near deaths (Kilpatrick and Berg, 2016). That adds up to more than 50,000 women every year. Black women are 3-4 times more likely to die in childbirth than white women, and 12 times more likely to die in NYC (Creanga, Syverson, Seed, Callaghan and William, 2017). There has been much research indicating that the cause of this disparity between black and white deaths is systemic, societal racism (Prather, Fuller, Marshall and William, 2016). There is physiological stress that stems from simply being a black woman in a white dominant culture. Amani Nuru-Jeter (http://sph.berkeley.edu/amani-nuru-jeter), a social epidemiologist at the University of California, Berkeley, has been doing research to find out how as she puts it, racism gets under the skin. Nuru-Jeter has authored many articles on how race, and socioeconomic status contribute to stress, which contributes to chronic inflammation. This inflammation is the cause of many conditions; including cardiovascular disease. We know that stress hormones interfere with all of our biological systems, and can lead to many health problems, including during pregnancy. The midwifery model takes into account the individual woman and her family, and treats birth as a normal physiological process, while the medical model views birth as a crisis waiting to happen, with management and intervention at its core. Buckley (2015) points out that the medical interventions so commonly used in labor and birth disrupt the biological process and the hormones that would normally be activated for childbirth. This interference has long-range negative implications far beyond the birth. The hormone disruption also impacts bonding and breastfeeding. Evidenced-based care takes into consideration the individual who requires the care, and what their wishes are. It also accounts for the latest best available external evidence and the expertise of the clinical care provider. In this context, some birthing women will need access to the medical intervention due to a medical condition, disease, or circumstance that could cause their labor and birth to stray from the normal physiological process. However, most healthy pregnant women can give birth without any intervention, with a trained midwife in attendance. Yet, in the Listening to Mothers Survey (2013), over 40% of U.S. women reported that they were induced to bring on labor. This single intervention can lead to a whole host of interventions, often referred to as the cascade. One intervention can lead to another. Often times with induction the contractions become irregular and unbearable, as the body’s own endogenous endorphins can be prohibited from activating as they would with a normal physiologic birth. Many women request epidural once artificial induction has begun. Epidural requires administration of lots of fluid and careful monitoring because mother and baby are both at risk for a suppressed respiratory rate. Epidural also limits a woman’s mobility during labor and birth. This can lead to a cesarean section, a long labor, or complications for the mother or baby. There is always a risk with any intervention; whether it be infection, lasting pain, increase the risk for future complications, or, even death. The long-term investigation done by ProPublica found several additional factors driving the rising U.S. maternal death rate. First and foremost is the access to care problem. Ideally, there will be a choice of hospital, birth center, and home. Women who have access to choice have the opportunity to give birth freely, exactly how they want to. This is where the first problem lies. In the United States, we do not have equal access to care. The color of one’s skin, and whether or not one has insurance or money affect access to care. In addition, there have been maternity hospitals in rural areas closing down, leaving many women without this choice, or forcing these women to commute an average of 29 miles more to get to prenatal care (Hung et al, 2016). Most of these closings are in areas that are economically disadvantaged, and also have fewer practitioners to begin with. Labor and birth units are very expensive to operate, with equipment that one sees in an intensive care unit. At the same time, midwifery, especially for homebirth, is still illegal in some states. This is another problem uncovered by the ProPublica and NPR investigation. Women have reported that they knew something was wrong but were told it was a normal after-birth reaction. Some persist and get the care they need, while others aren’t listened to fast enough to save their life. Many of the deaths are completely preventable. In many hospitals it isn’t routine to share information about warning signs, and when to seek medical attention. Listening to women is one of the most important things we can do to change what is happening. And, of course, educating women and families about the warning signs. Mother’s health and lives matter greatly. It is a great indicator of the health of our nation. The United States can do better. We can learn from the California Maternal Quality Care Collaborative, where they have been gathering the data, developing toolkits, and improving outcomes. We can also learn from other countries where the midwifery model of care proves to produce better outcomes. There are many solutions to the challenges we have with the United States maternity care system. Knowledge is power. Educating women early in pregnancy or before pregnancy, about the normal physiological process of birth, training providers, and using the midwifery model of care as the norm would improve outcomes significantly. Women and families deserve better. Martin, J. A., et al. (2017). “Births: final data for 2015, CDC.” D.; and T.J. Mathews, M.S, (2017), Births: Final Data for 2015.Gregory, K. D., et al. (2012). “Cesarean versus vaginal delivery: whose risks? Whose benefits?” American journal of Perinatology 29(01): 07-18. Kilpatrick, S. J. and C. J. Berg (2016). “Lessons of severe maternal morbidity.” Contemporary OB/GYN 61(9): 37. Creanga, A. A., et al. (2017). “Pregnancy-related mortality in the United States, 2011–2013.” Obstetrics & Gynecology 130(2): 366-373. Fauveau, V. (2011). Delivering Health, Saving Lives. The State of the World’s Midwifery Report. MacDorman, M. F., et al. (2016). 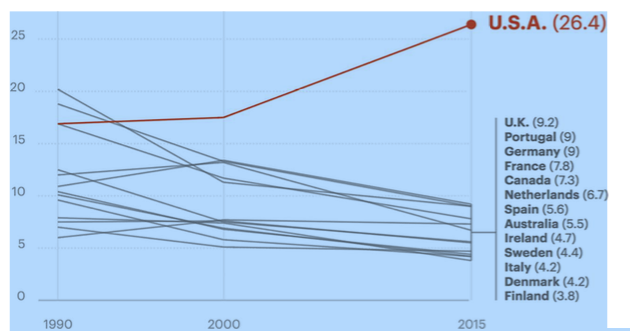 Is the United States Maternal Mortality Rate Increasing? Disentangling trends from measurement issues Short title: US Maternal Mortality Trends. Obstetrics and Gynecology 128(3): 447. Sandall, J., et al. (2016). “Midwife‐led continuity models versus other models of care for childbearing women.” The Cochrane Library. Hung, P., et al. (2016). “Why are obstetric units in rural hospitals closing their doors?” Health services research 51(4): 1546-1560. Kassebaum, N. J., et al. (2016). “Global, regional, and national levels of maternal mortality, 1990–2015: a systematic analysis for the Global Burden of Disease Study 2015.” The Lancet 388(10053): 1775-1812. Buckley, S. J. (2015). “Executive summary of the hormonal physiology of childbearing: evidence and implications for women, babies, and maternity care.” The Journal of perinatal education 24(3): 145. Sandall J, Soltani H, Gates S, Shennan A, Devane D. (2016) Midwife-led continuity models versus other models of care for childbearing women. Cochrane Database of Systematic Reviews, Issue 4. Dalton, ME et al (2103), Where’s the M in Maternal-Fetal Medicine, American Journal of Obstetrics and Gynecology, Volume 208, Issue 6, Pages 442–448.